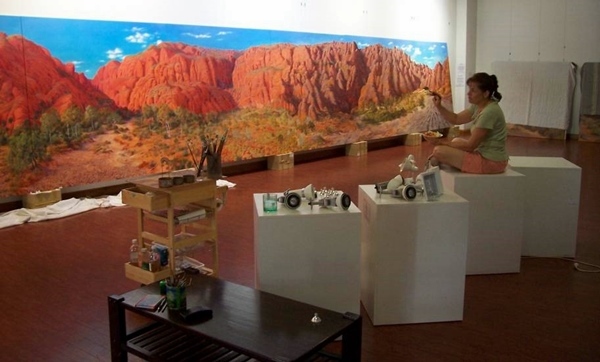 In May 2008, Nadeen’s first panorama, Beehives of the Bungle Bungle was taken off the wall in the Lovell Gallery in readiness for its successor to be installed, as part of the annual Argyle Diamonds Ord Valley Muster Art Appreciation Evening. The unveiling was officiated by The Hon Norman Moore MLC, who flew up from Perth for the occasion. 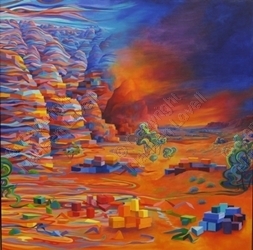 The work, comprising eight 2 x 2 m. panels for practical purposes, depicts the Bungle Bungle Massif from Echidna Chasm, to Piccaninny Creek - some 45 klm. 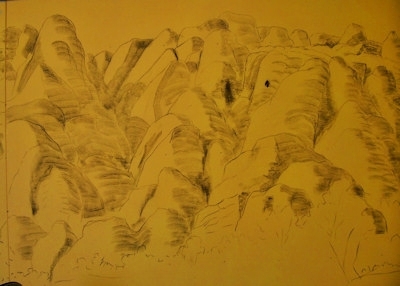 This long continuous scene, has been necessarily compressed and depicts the contrast from the Northern Bluffs to the famous Beehives. 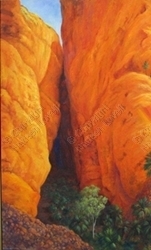 At the time of commencing the work, Nadeen had been walking this area in Purnululu National Park, on and off, for over eighteen years, thus acquiring a good knowledge of the geology and botany, the endless colour and seasonal changes. Her intimate ‘feeling’ for the spirit and energy of this area has been publicly acknowledged by one of the Traditional Owners at an environmental meeting. 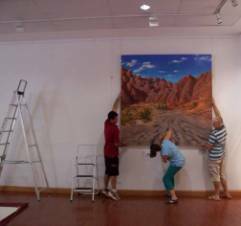 This mammoth artwork, after over eight years hanging in The Kimberley region, is ‘resting’ in Perth, awaiting its next journey and exhibition. High quality reproductions on paper or canvas are still available by contacting the artist (see below). Prices include GST, however do NOT include, stretching, framing or package and post. Packaging and insured post is approx $15 to $25 depending on size and destination, within Australia. Art work can also be sent Internationally. 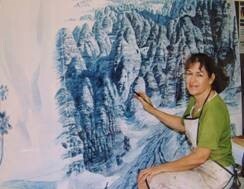 In 1992 Nadeen painted the 11 metre panorama 'Beehives of the Bungle Bungle'. 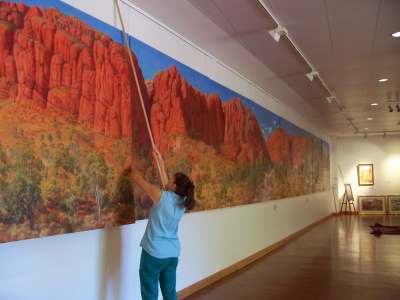 Hung in the Ivanhoe Gallery Restaurant in Kununurra for the next nine years, it soon became known as the Bungles Mural. This term is not technically correct as it was not painted directly onto the wall but onto six 1.8 square, canvas panels. This enabled Nadeen to retain ownership and also for the artwork to travel. 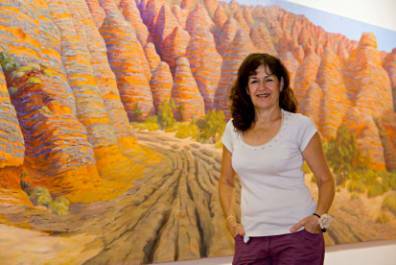 Nadeen in front of ‘Beehives of the Bungle Bungle’. Three of the panels went to exhibition in Sydney in 1997 and the whole panorama travelled in a Slingair bus (compliments of Kerry Slingsby), clear across the continent to Melbourne, in 2001. Eventually, after hanging in pride of place in the new gallery from 2004 to 2008, this work now hangs in the foyer of the Perth Convention Exhibition Centre. 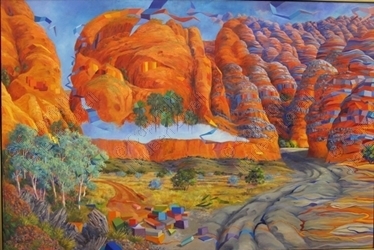 This work was originally created in 2000, for entry into the Wynne Landscape Art Prize (held in conjunction with The Archibald). 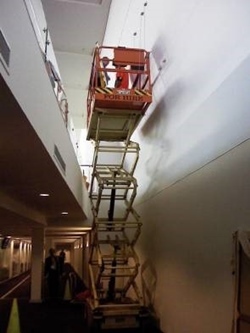 Although it suffered the fate of so many thousands of rejected art works from that competition, it went on to be exhibited in Melbourne, on the proviso it was not for sale, as a group of ardent Kununurra patrons had already offered to purchase the work. Encouraged by long term locals and keen supporters of Nadeen's Diversion Gallery, Pat and John Buchanan, several other participants joined the group. 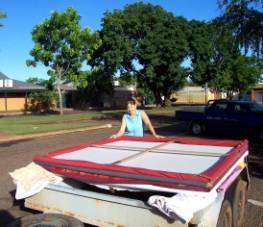 Kerry and Pat Slingsby, Lars Moir, Keith and Anne Wright, The Ord River District Co-op and Shire of Wyndham East Kimberley joined together to donate monies which then were used to purchase the art work in 2001. It was then handed over to the Shire in trust for the Residents of Kununurra. 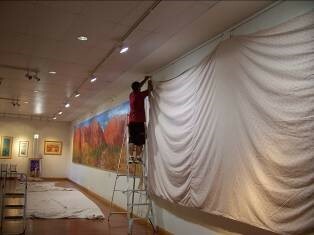 This work now hangs in the very modern new building which houses the Kununurra Library. 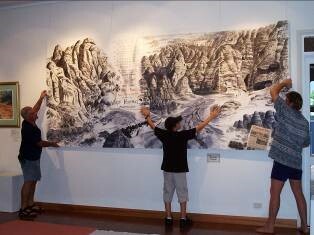 This piece Celebration , a seven panel ink on canvas, 450 x 180cm, was created to celebrate the World Heritage listing of Purnululu National Park, in 2003. However, it has recently morphed into several different paintings.....such is the whim of an artist... two of which have already gone to new homes. Two more are ready for exhibition and two others are works in progress. The seventh panel which holds the history will be retained as is , for display in future exhibitions.